This post is dedicated just to the [DAPUserProfile] shortcode. To see the rest of the DAP Shortcodes, click here. This is the shortcode that displays all of the user profile fields on a page. Simply enter it on a WordPress page, save it, and when you view it when logged in as a user, it will display the DAP user profile form, with the logged-in user’s information displayed in the form fields. As DAP Admin, you can customize which profile fields to show to your members, and which ones to hide. Just set the profile field that you don’t want displayed, to “N” in the tag below. Default is "Y". So Leaving out the text (for eg.) showLastName="Y" entirely from the shortcode, is the same as setting it "Y", which means it will be displayed. Entering just [DAPUserProfile] into a page, will show ALL fields. This post is dedicated just to the [DAPUserLinks] shortcode. To see the rest of the DAP Shortcodes, click here. This is the shortcode that shows the user a list of all of the products that they have access to, and details about each product – like name, description, links that have already been dripped, etc. This is similar to %%USERLINKS%%, but more advanced and more customizable. You can customize most of the elements of this shortcode, as shown below. You can even customize this to show details of a specific product (instead of all products). Most of the elements are self-explanatory. Here are a couple explained in detail. 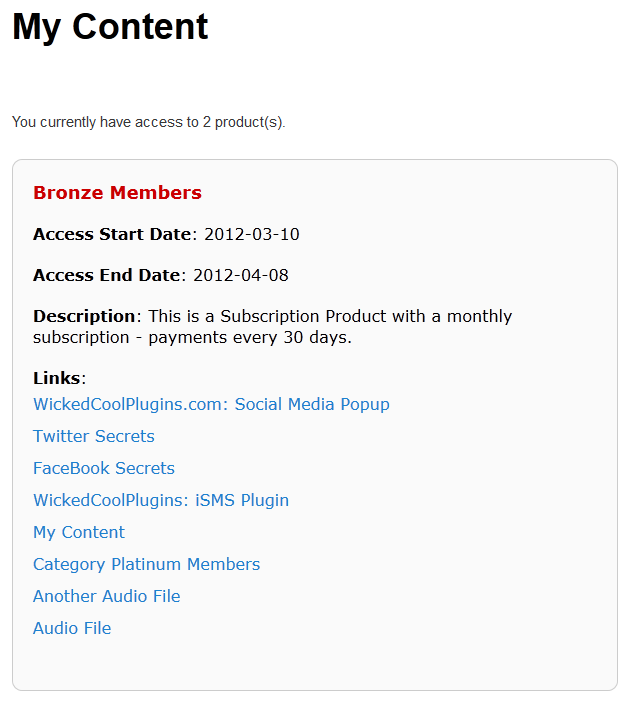 showproductcount=”N” will disable the heading “You have access to (X) products” at the top of the “My Content” section. So, here’s another version of the DAPUserLinks shortcode that shows oldest links at th top, and does not show the product-count heading. productId is by default set to “ALL” which means details for all products that a user has access to, will be displayed on that page. You can also configure it to show for just one product (productId="8") or a few select products (productId="8,11"). This was introduced in DAP v4.5. It allows you to suppress all listed product id’s (either just one, or multiple product id’s separated by commas) from being displayed in the list. The easiest way to organize links, is to set the dripping “day” for each link. So if you’re setting up 5 links to be available on Day #1, 2, 3,4 & 5, then in the “My Links” section, DAP will display the links in “Newest On Top” order. So the newest link (Day #5) will appear first, followed by Day #4, and so on, until Day #1. 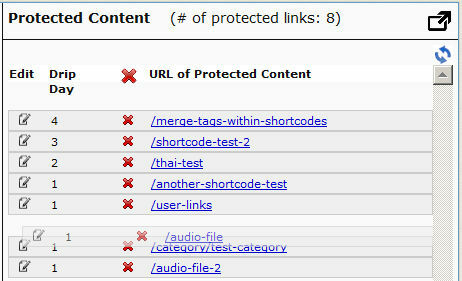 If you have multiple links that you’re making available all on the same day (like say, all on Day #1), then once you’ve added the links from left to right in the ContentResponder tab of your DAP Product, you can then hold down any row from the Protected Content section, drag and drop and re-order it however you wish to. Remember that the drag-and-drop re-ordering will only work within different links that are all set to drip on the same day. So for eg., dragging a day 1 link above a day 4 link (see screenshot below) will not work, and it will simply come back to it original position after refreshing the screen. But dragging one Day #1 link above or below another Day #1 link will re-order the links exactly in that order. If you see the links order in the above screenshot, that’s the exact same order in which the links will appear when the member views their “My Content” page (or whatever you have called the user links page).